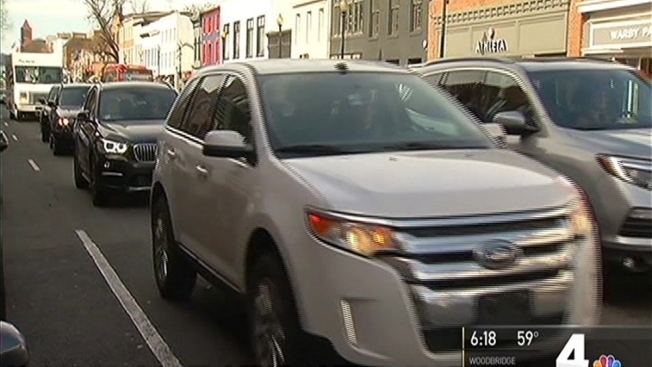 A study by the traffic tracking group INRIX said the D.C. region has the sixth worst traffic congestion in the U.S. and the 15th worst in the world. It's costing people both time and money. However, there is one improvement. News 4's Transportation Reporter Adam Tuss reports. Commuters in the Washington, D.C., area experience traffic woes practically every work day, and a new study confirmed what those commuters likely know. D.C. traffic is among the worst in the country. INRIX ranked 204 cities in the United States and more than 1,000 around the world in the largest study of traffic congestion. Based on the findings, the D.C. area ranks sixth overall for most congested urban areas in the U.S. According to the study, D.C.-area drivers spend more than 11 percent of their trip in congestion, costing them $1,694 per driver in 2016. The study said congestion costs the city nearly $3 billion from direct and indirect costs in 2016. Los Angeles, which also ranked the worst city in the world, New York, San Francisco, Atlanta and Miami ranked higher than Washington on the most congested ranking for U.S. cities. Dallas, Boston, Chicago and Seattle were ranked below D.C. in the top 10. Globally, Washington ranked 15th in the world in 2016, just behind Mexico City. In the 2015 study, D.C. was ranked 40th in the world.